Most of the medical practices use EMR/HER and practice management systems. Very few of them have a good backup strategy. Also how much should a small business spend on a decent backup solution? One of the medical practices came to me and mentioned that a company is quoting close to $3000.00 initial setup fee and $500.00/month for their backup solution. I really thought, it was a big rip off. Decided to spend time to research how much would it take have a decent backup operation in place. The following picture shows a minimal solution for a small business. 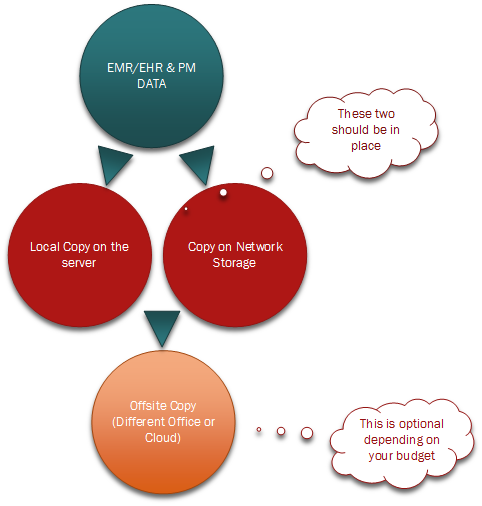 You should definitely have a mechanism where you make a copy of important data on the server itself. In addition to this, you should have a robust (at least) RAID 1) network storage device. Important data files should be regularly backed up onto this storage device. Coming back to my original point, how much should a small business invest in a back up solution. I looked at most of the devices with 4TB RAID 1 configuration. On an average they cost around $800.00. Setting up this on the network might take an hour and scheduling regular backups might take 2-3 hours. If you add up all this cost, it will be around $1000.00 (one time initial cost). One of the devices had some sort of solution (optional) already built in which will backup the storage data onto a cloud storage. The cost of this was around $1000/Year (~300GB). But, still this far better than $500/month which would have cost you $6000/Year. Having a backup solution takes you half way there. First, you have to regularly make sure that backup is happening as planned. Also,it is important to make sure that, your business can be up and running in a short amount of time. 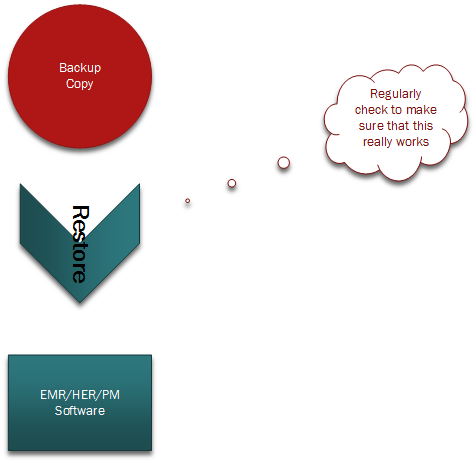 Regularly restore (to a dummy environment) from the backups and make sure it works.